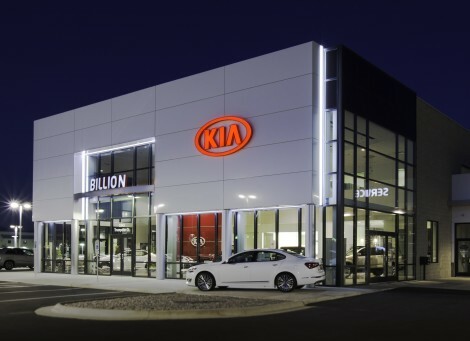 The new Kia Facility branding program, released by Kia Motors, represents a contemporary and bold elegance, enhancing the Kia customer experience and providing a façade which is consistent with the brands updated product offerings. Metal Design Systems was awarded exclusive manufacturer for the Kia Gallery branding wall, working directly with Kia Motors and Interbrand Design Forum. 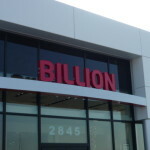 In this MDSI was able to provide design assistance and final selections for the panel module sizes, dealer name bar, lighting element around the gallery wall, column cover diameter and sizes, curtain wall recommendations, budget solutions, and means and methods for the attachment systems and installation. Design intent drawings for the branding wall were developed for communication with the dealerships and a preliminary 30’ prototype was built in house at Metal Design Systems Corporate headquarters in Cedar Rapids to review the final aesthetics. The Kia Gallery wall features a custom 24” lightweight framing system behind our Series 20 Spline Reveal, Drained and Back Ventilated Rainscreen. This truss system provides the necessary depth for the recessed light box for the brands ambient lighting, as well as allowing for the 22’ long, 12’ radius dealer name bar and 16” diameter column cover system. 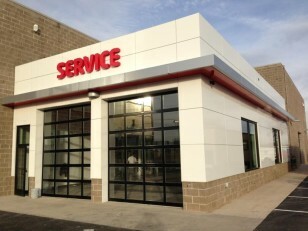 Metal Design Systems has completed the first initial 50 Kia Gallery Branding wall projects around the US.